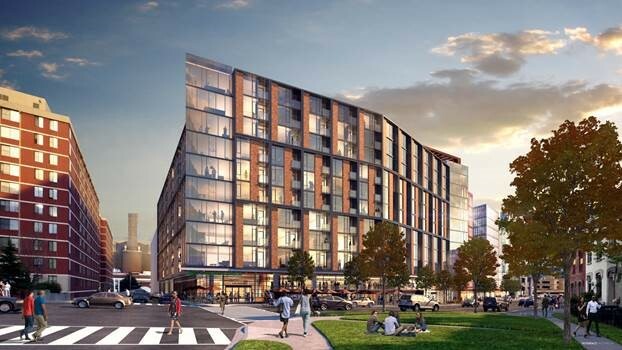 “MRP Realty, developers of commercial, residential, and mixed-use real estate across the Washington Metropolitan region, and Ellis Development Group, in partnership with JBG SMITH, have broken ground on their new mixed-use development, The Wren, located at 965 Florida Avenue NW. The celebratory event took place on November 30, and included remarks by Mayor Bowser. The Wren is a 289,686-square-foot development in the Shaw neighborhood. The building features 433 residential units, of which 132 units will be affordable. Along with best-in-class amenities, The Wren will be a LEED Silver Certified building with solar panels providing a portion of the building’s energy. Anchoring the ground floor will be a 43,406-square-foot Whole Foods–the seventh location of the grocery retailer in the District and its first store in the District since being purchased by Amazon.